Jerry Panas and I coined the term “Power Questions” in our book of the same title. Somewhat to our amazed delight, it went on to become a global best-seller that has been translated into 21 languages. Power Questions, put simply, are open-ended questions that engage the other person in a thought-provoking conversation. They uncover the real issues that need to be discussed. They help you get to the root cause of important problems and dilemmas. They reframe the conversation in new, transformative ways. They surprise and, often, delight. 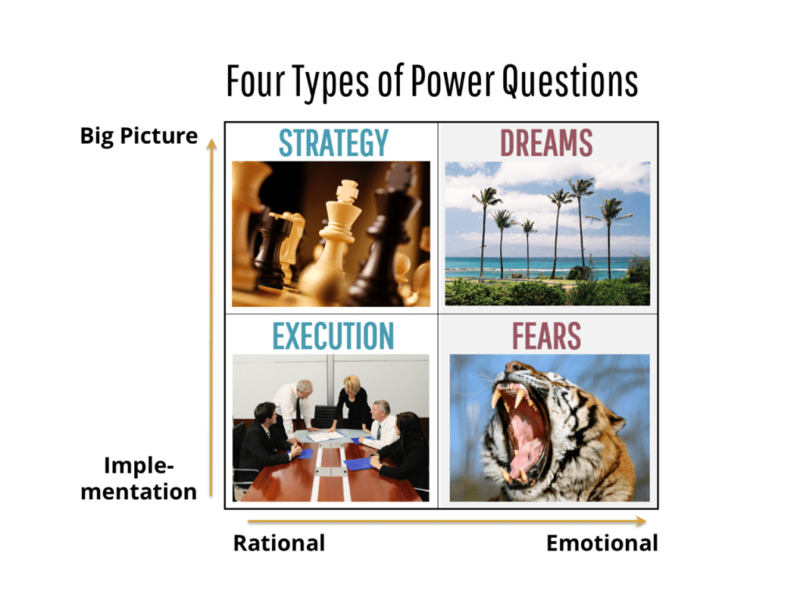 While there are many different types of Power Questions, the following matrix sets out four important areas in which you should be asking thoughtful questions. Whether you’re talking to a client, your manager, a colleague—or your friends and family—these four question quadrants will, together, yield a lode of pure gold. There are two key dimensions or axes that define the four quadrants. First, are you focusing on implementation—the details—or on the big picture? So that’s one distinction. With a colleague, that might mean talking about how they are going to handle a tough project they’ve just been assigned—implementation—versus discussing their how that project fits into the company’s strategy—the big picture. The second distinction is this: Are you in the realm of the rational or the emotional? So with a client, that might mean discussing how your technology solution can help them improve customer service—a rational question—versus asking what concerns or fears they may have are about using a new solution, which delves into the emotional, or personal realm. In the lower left Execution quadrant, you’ll ask rational questions about implementation: “How are you going to do that” or “What is your timing?” and so on. But often, you also need to move up to the Strategy quadrant in order to really understand the context for what the other person is trying to accomplish. If a client asks for help clarifying organizational roles and responsibilities, you would follow up with a question or two in the Strategy quadrant to clarify the backdrop to the request.